Over 500 cards of various types, including Characters, Locations, Weapons, Allies, Spells, and many more. Adventure Path 1 (this is the first expansion set, and comes included in the base set; there are 5 more you can purchase and play through sequentially). I’ve made sure the images in this review are only from the base set, and the Villain and Henchmen shown are from the first scenario, so no real spoilers. Each player picks a Character. There are 7 different Classes with the base game (Oracle, Slayer, Kineticist, Alchemist, Rogue, Wizard, Spiritualist). You can also purchase a Character add-on pack that provides 4 more Classes (Cleric, Occultist, Magus, Druid). 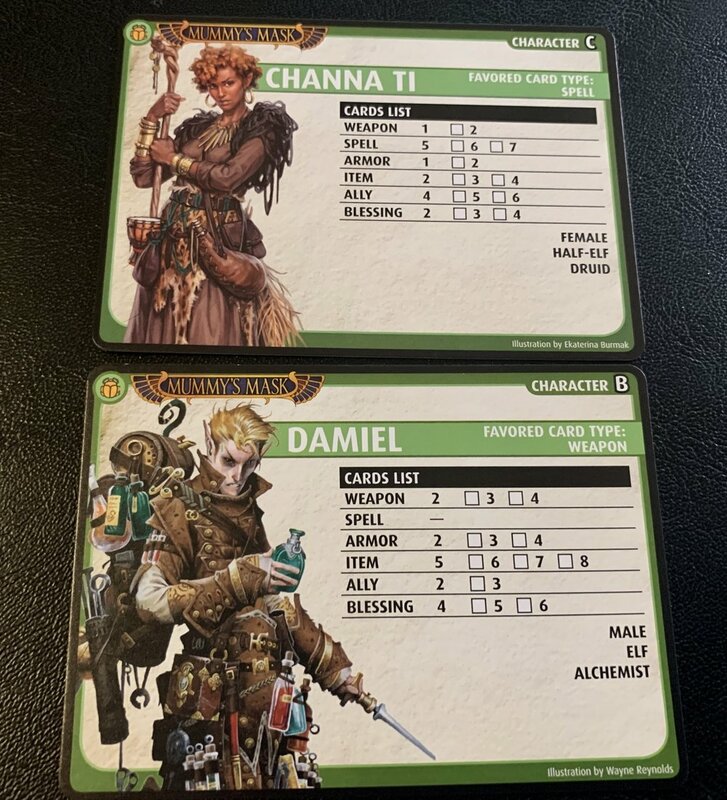 Each character comes with a suggested starting list of cards for their deck, or you can craft your own from cards with the Basic trait. But you still have to hold to the types and numbers of cards on the Character’s card. So they might have to have exactly 5 Spells, or 1 Armor, or no Weapons at all. Now you’ll gather the three specific cards that will help you set up the scenario you’ll be playing. First you’ll set out the Mummy’s Mask Adventure Path card, which lists each Adventure Path and the reward(s) you get for completing all of them. Then set out the current Adventure Path card. 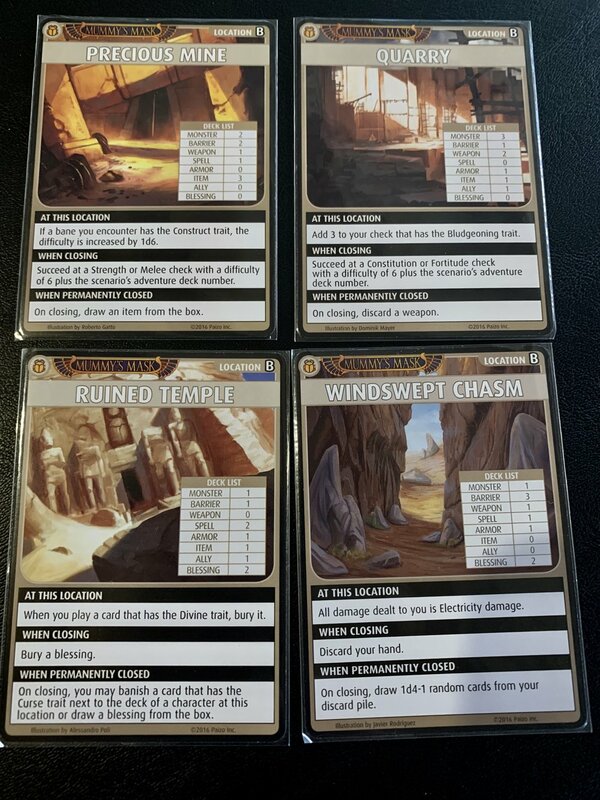 The Path for the base game is Cross the Pharaoh’s Land, and this card lists each of the scenarios you’ll be playing, along with any special rules that might be in place for this Path. Finally, set out the specific scenario that comes next on that Adventure Path card. It will list the Locations you’ll use, the Villain and Henchman you’ll use, and any special rules in place for this scenario. Now you’ll grab Locations. The number and specific ones you use will depend on the number of players. Each Location has its own deck, made up of Spells, Weapons, Barriers, Monsters, etc. You won’t know what, exactly is in there, but you’ll know that if you go to, say, the Ruined Temple, you have a good chance of getting a Spell or a Blessing. All Locations are available from the start, so you’ll just set out the Location cards with some space between them, and place its deck next to it. Each Location also has an At This Location special rule. Sometimes they’re good, such as the Stonework Passages, where damage dealt to you is reduced by 1. Sometimes they’re bad, such as the Hot Springs, where you have to discard any Weapons you play. Each scenario will tell you which Villains and Henchmen to grab from the box. You’ll shuffle them all together, place one card on top of each of the Locations, and then shuffle the Location decks. So you know each Location has either the Villain or one Henchman in it—you just don’t know who is where. Then you build a Blessings deck—this is 30 random Blessings shuffled into one deck, that act as the game’s timer. Then each player draws a starting hand. How many cards you get depends on the character. Each character also has a favored card type (Weapon, Spell, etc. ), and if your starting hand doesn’t contain any cards of that type, you’ll discard that hand and draw a new one, repeating this as necessary until your hand has at least one of that card type. Then you shuffle the remaining cards back together to form your draw pile. Decide who goes first, and you’re finally ready! Advance the Blessings deck: Simply turn over the top card onto a discard pile. If you ever have to remove one or more cards from the Blessings deck but there are none left, the players lose. You never obtain these cards, but some cards might refer to that top card of the discard deck. Move: You may move your character to another Location, though don’t have to. This might trigger effects when you leave one Location or enter another. Explore: You’ll interact with cards in the Location. We’ll look more closely at this later. Close a Location: If your Location has no cards remaining, and hasn’t already been closed, you can make one attempt to close it. End your turn: Apply any effects that happen at the end of the turn, and then reset your hand by drawing up to your hand size. Let’s look more closely at Exploring. You can Explore once for free without having to play any card. You simply turn over the top card of your Location, and if it’s a Boon (good things such as Items, Blessings, Weapons, etc., you can attempt to acquire it. If it’s a Bane (bad things such as Monsters, Henchmen, Barriers, etc. then you have to try and defeat it. Doing either of these checks involves a series of steps. First you apply any effects that happen when you encounter a card. It might be taking damage, or forcing you to discard an Armor, or any number of things. Then you can use a power or card to evade the bane, and you shuffle it back into the Location deck. Some cards and power have effects that take place before you act, and those happen now. Now you’ll use skills, and any powers on cards that you can and want to use, to attempt the check. Now apply any effects that happen after you act. Finally, you resolve the encounter. If you passed the check on a Boon, you gain that Boon to your hand. If you fail the check, it goes back into the box. If you pass the check on a Bane that’s a Monster or Barrier, it goes back into the box. If you don’t, and this is true of most Banes, you take damage equal to the difference between your roll and the number that was required to pass the check. You take this damage by discarding cards from your hand. (You can also play cards that might decrease that damage.) Then the Bane is shuffled back into the Location deck. Henchmen are a little different. For most of them, if you defeat the check, you can attempt to close that Location. The Location cards have a When Closing instruction. It might be take 1 damage, in which case you’d take that damage and close the location. It might be something such as discard a Blessing, and if you don’t have a Blessing to discard, you can’t close that Location until you do. If you defeat the Henchman and succeed at closing the Location, then you look through the cards at the Location and make sure the Villain isn’t there—putting every other card back in the box. If the Villain IS there, then the Location isn’t closed, and that Villain card is the only card there. You know exactly where he is, which is very useful. If you defeat the Villain at a Location, then things also get a little tricky. If there are other players at other open Locations, they can attempt to temporarily close the Location they’re at, which will keep the Villain from running away there. As long as there are any other open Locations, then the Villain runs away to one of them—but you do close the Villain’s current Location. If his or her current Location is the only open one, and you defeat that Villain, then you’ve likely won. Now, going back to your initial Explore, you can play other cards for other effects. You might be able to Cure someone (they get to shuffle cards from their discard into their deck). Or you might be able to use a card to Explore again, which can be useful, since the game has only 30 turns, so you often feel yourself running out of time, and extra Explores are good. You can also Examine a card, which means you can look at it, and then decide if you want to encounter it. But Mummy’s Mask includes cards with the Trigger keyword, and if you Examine those cards, then something bad happens, and you’re often forced to encounter that. In addition to Triggers, this set also introduces Traders, people who can offer you new cards after your adventure. Another new feature is Scourges. It’s bad things that can happen to you, and have a lasting effect until you can get rid of it. For example, you might have to discard a random card from your hand every turn when you refill your hand. You’ll have some winning condition, depending on the scenario. As far as how you lose? Well, if you run out of cards in the Blessings deck, you lose. If all of the characters die, you lose. And yes, it’s possible for your character to die. If you’re ever required to remove 1 or more cards from your deck, and you don’t have enough cards, your character dies. Next time you play, you’ll choose a new character (including the one who just died, if you like). You’ll form a new deck, but probably a crappier deck than the one from the character who just died. Don’t die if you can help it. What a fun game! It’s tense and exciting, and that Blessings deck is putting constant pressure on you. Most cards can be played in more than one way, so you have decisions to make. Do I play this card to get another die now, when I’m “just” fighting a Monster? But what if the next card is the Villain? The choices aren’t obvious, and dice add randomness and uncertainty to the whole affair. And it’s pretty tough, too. We’ve lost plenty of scenarios. But one of the (admittedly few) advantages this has over, say, Gloomhaven, is that when you have to replay a scenario in Gloomhaven, you’re playing everything the exact same way. Same bad guys. Same setup. Same everything. But here, since you build every Location deck from scratch, you’ll have a different experience each time. New Monsters. New Barriers. New Allies. New order of the cards. And the Villain probably won’t even be in the same Location as last time. So replaying a scenario doesn’t feel as…annoying as it can in other games. I picked up the Character Class Deck, and will always do so with any base set I get in the future. Not only because I just like more variety, but the additional Classes are genuinely fun and interesting—they don’t feel like afterthoughts or just slightly different versions of Classes you already have. I’ve played half a dozen different Classes, and every one of them was fun and useful, in different ways. The Oracle is great at getting rid of Curses, and casting Spells. The Rogue is great at getting past Barriers, but still holds her own in a fight. And the Spiritualist always has the ghost of her long lost love Honoraire with her, helping her fight, and taking damage for her. One of the things I appreciate is that all of the scenarios aren’t simply: Corner and kill the Villain. 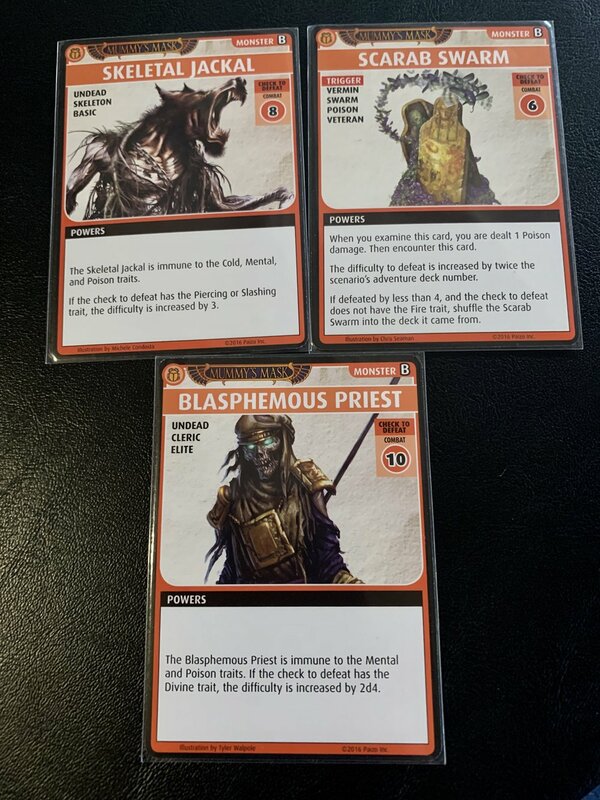 Designer Mike Selinker and his team have come up with interesting ways to play with that core tension of Villain/Henchmen to give you alternate winning conditions. One of the early scenarios of the base game has you shuffle Sandstorms into the Blessings deck. Whenever you draw one at the beginning of the turn, it can throw you to a new Location. That’s a clever way to mess with things, but without a lot of rules overhead. I have a couple of complaints—neither of which are major. First, this game is full of AWESOME artwork—really terrific and evocative stuff. Except when it’s not. There are a handful of cards that have hilariously terrible art on them. I know Paizo is able to pull from their vast library of already created art pieces, but sometimes they need art for something that’s not in the archive, and it shows. It’s just a few of them, but because the rest of the art is so great, it makes these bad pieces stick out even worse. It doesn’t affect gameplay in the slightest; you’ll just chuckle, shake your head, and move on. The larger complaint is that it’s a difficult game to learn from scratch. There are a lot of keywords and concepts that you’ll just have no context for. There’s a Quick-Start Guide that’s meant to ease you into the game, but I actually think it confused me more than I would have been had I just jumped in. In fact, my 11-year-old and I tried to learn the game using that Guide, and it was so bad that he was put off the game for a while. I’d suggest giving it another shot, and he’d go, “Uh…I’m not really interested in that…” Now that we’ve learned it, he LOVES this game—I mean really loves it. Top 10 for him, for sure. If you can, have someone teach you this game. If you can’t, just read the regular rules yourself a few times, maybe watch a How To video on YouTube, and dive in that way. It’s not a difficult game at all, once you know what’s going on. Another option is to play it solo. I actually did this, even though I don’t play many games solo. I played two characters, and had a great time—and learned the game. 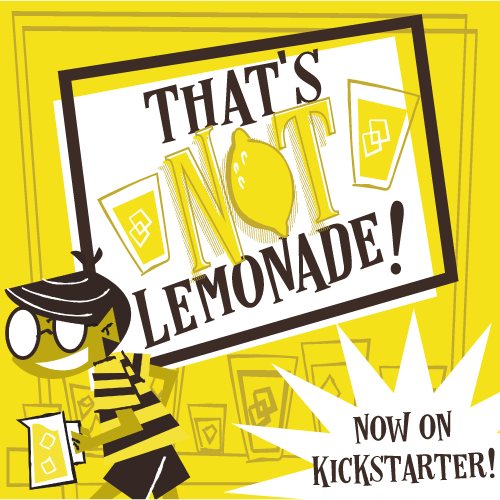 This isn’t the sort of game that works well for a one-off adventure, so know that. If you like it, you’ll want to play through the campaign, which means further money commitment. : five more adventures at $20 MSRP, plus the Character Add-On deck. But that’s 35 scenarios for the whole arc, which is a lot of gameplay. Firestone’s Final Verdict—I’m only partway through the arc of this game, and I’ve already made some terrific memories. I’ve had an absolute blast playing this with my 11-year-old, and we can’t wait to see what the next scenario throws our way. I’m a bona fide fan, and recommend this to anyone who loves puzzley monster fighting. Great job Paizo! Well that’s it! Have you played any of the Pathfinder Adventure Card Games? What are your thoughts? Let us know in the comments! And thanks for reading!